Karima Christmas-Kelly scored a career-high 27 points to lead Dallas past Indiana. Photo by NBAE via Getty Images. Dallas – Coming off their worst drubbing of the season, the Dallas Wings turned the tables Tuesday night and beat the Indiana Fever, 89-62, for their largest win of the year. Karima Christmas-Kelly led Dallas with a career-high 27 points, while rookie Allisha Gray added 14. 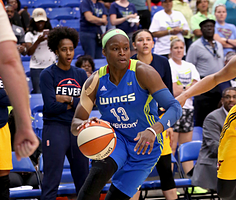 Coming off a 42-point loss to Phoenix Saturday, the Wings were in attack mode against the Fever, scoring 44 of their points in the paint and out-rebounding the visitors, 42-30. There were times when Dallas players were battling each other for boards. Glory Johnson, who had eight rebounds on the night, crossed the 1,000-rebound career mark in the process. Christmas-Kelly attributed the win to team play. 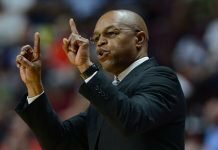 Coach Fred Williams said the team was still able to take away some lessons from the weekend’s loss. Indiana was looking to split their road trip after losing to the Seattle Storm two days ago. Natalie Achonwa led the team with 13 points, while Marissa Coleman and Candice Dupree each added eight. Dupree said the Fever weren’t effective stopping their opponents from scoring inside. The two teams will face off again June 3. The Wings take on the New York Liberty at Madison Square Garden the night before. Williams said they will have to make changes before hitting the road. 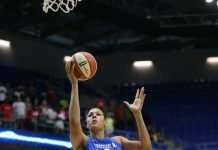 Dallas will be without Courtney Paris for up to eight weeks, as she injured her knee against the San Antonio Stars last week.